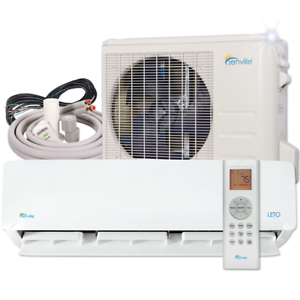 The Senville SENL-24CD Air Conditioner maintains a comfortable environment. It is a ductless mini split air conditioner, which achieves the Seasonal Energy Efficiency Ratio (SEER) of 15 for low energy consumption. Un paiement immédiat de 1 074,99 $C est requis. Installed this unit in my remodel because we didnt want duct work. Did all the work myself, im handy so it was easy for any good diy person! We have around 1000 square foot of space and the first night it was 28 degrees f. I turned it up to 82 and got complaints it was to hot. GOOD DEAL😎... after heating with wood most of this winter in missouri. To have a decent priced unit with even heat distribution will be a blessing. 2 things 1 the description states that no wireing is included. But the signal wire between the two units is included. Great suprise to not have to pruchase it additionally. 2 the instructions say you will need a flareing kit. My line set was factory flared another great suprise. With factory flares i tightened the connections good and snug and with some planning and research i decided not pull a vacuum to check for leaks but did soap test ,no bubbles. Another cost avoided having to get a ac guy to come over and pull a vacuum. Its been pumping heat for 24 hours no issues. I mounted the unit low on the wall to draw air from the floor for more even heating. Pretty sure it will work fine for cooling also with the return being on top of the unit. Hope this helps other make a decision but so far i love it. Fyi my brother just had to fix his old heat pump...one part cost almost as much as this whole system. Installed unit in a modified enclosed porch. Lots of glass and metal roof with little insulation value. Room is 525 sq ft. I basically doubled the btu rating needed and feel it was wise decision. Outside temps at 105° and room cools to 78° quickly with no problems. Very surprised how quiet both indoor and outdoor run. Install was straight forward and not difficult. One thing to note is the supplied low pressure copper line is not smooth but spiral grooved. This helps in bending but you CAN NOT shorten and reflare. I was able to create a one foot diameter coil and hide in wall to achieve length needed. Anxious to see what my power bill increase will be. Only slight negative to unit is remote control and instructions. I still haven't figured out how to get timer to work and as I see it the unit never cycles off when temp is reached. EVERYTHING NEEDED TO INSTALL UNIT IS INCLUDED. great value, nice looking product. Worked great, came in safely on a pallet, and no issues so far. Already using to heat a 1200 sq. foot work shop, and it seems to handle it. It is fairly easy for a DYI, but would recommend an HVAC guy connect the lines. The unit is working out very well, and has made the heat so much more tolerable. The unit is quiet, seems efficient, and cools the area very well that we wanted it to take care of. We are very pleased with the results on installing this unit. It was an easy install and throws a good heat. Runs quiet. I was quoted almost 5 gran to install a two ton by a local installer. There was a 10 year warranty. At $1050 with a five year warranty and installing by a local electrician and a Power engineer friend, I can replace it once and still have it for half price.